I think you've been waiting for these photos long enough, don't you? For those of you who don't know, we began renovating our kitchen early December. We rented the house for years until October, so we've been anxious for years to do this very thing. It's taken weeks longer than we expected but it's safe to say we're done. I have several 'before' photos that I'm still gathering so I'll post those tomorrow but in the meantime this is the 'after'. It's so great to finally have a kitchen that represents us & how we live, and not some generic ugly contractor kitchen! The last two weeks have been very dark and cloudy, every single day, so I waited for a day with some sun but it never came. These photos aren't my favorite but for now they'll do. A little about our new layout. I've had this in mind for at least the last two years. A wall on the left for appliances and a big pantry cabinet. The middle wall with only the cooktop and a row of upper cabinets. 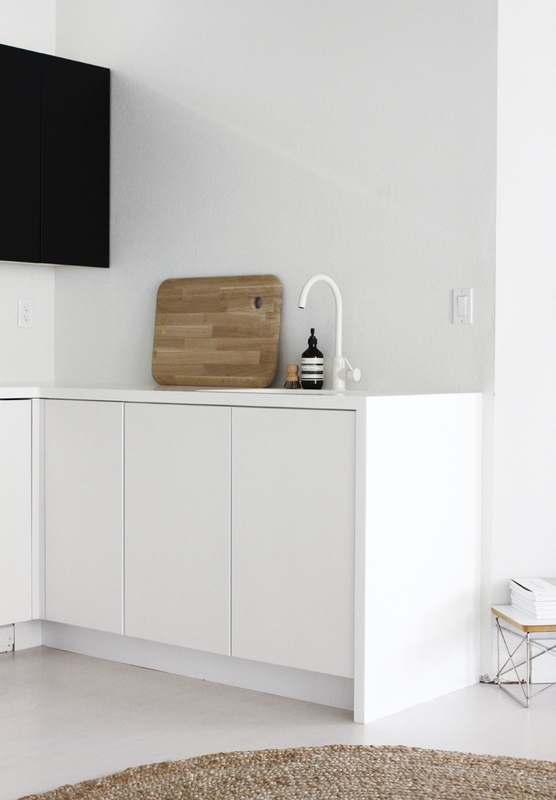 The right side would end where the wall bends, giving just enough room for the sink. Almost everything in the kitchen had to be moved-plumbing for the sink and dishwasher needed to be relocated. Electricity for the microwave and oven needed to be moved. A new outlet for the cooktop needed to be installed. But it was worth it to have our new appliances in the places we'd use them best. My husband and I talked back and forth about the cabinet finishes and colors for a long while. We considered light and dark stained wood cabinets with circular holes cut out of them instead of handles, all white everything, dark grey cabinets with wood herringbone counter tops, concrete or tiled floor OR features like an island in the kitchen with no upper cabinets or just a few open stainless steel shelves. 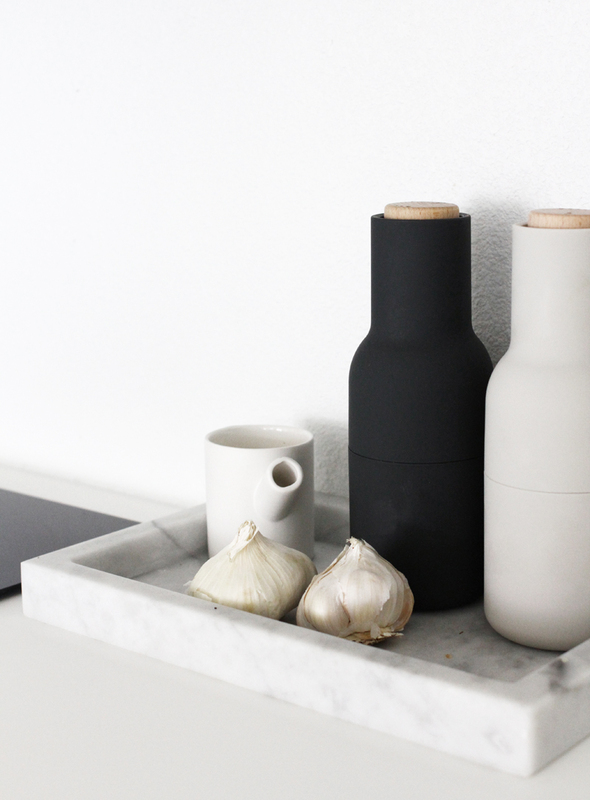 Brass or chrome accents, slim handles or no handles at all. In the end we decided that since the kitchen is in the middle of our house, sharing a space with our dining table and living room and a wall with the office, it was best to make it look like an extension of what we already had. 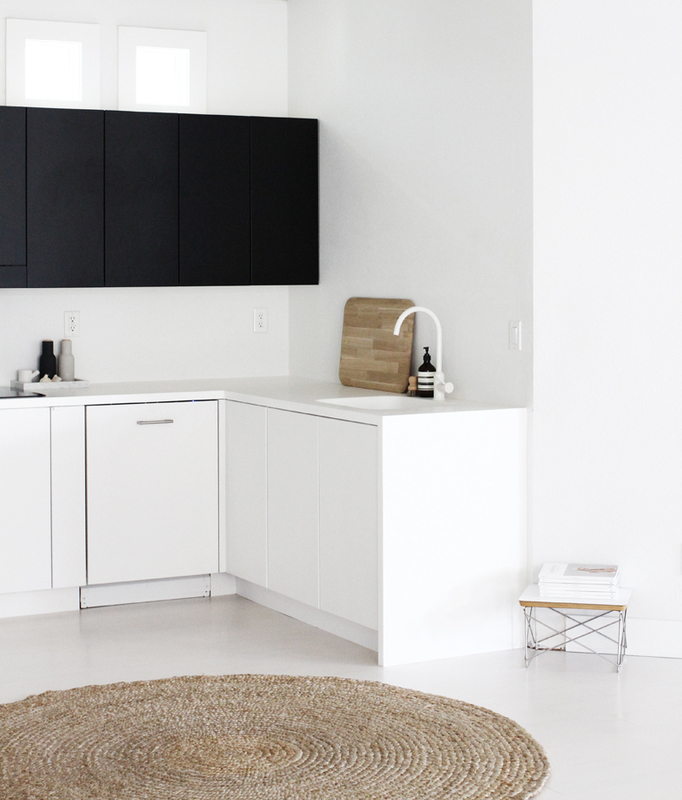 We continued the same flooring and chose white cabinet doors, a white sink & faucet (because we wanted them to blend in) and matte white counters. 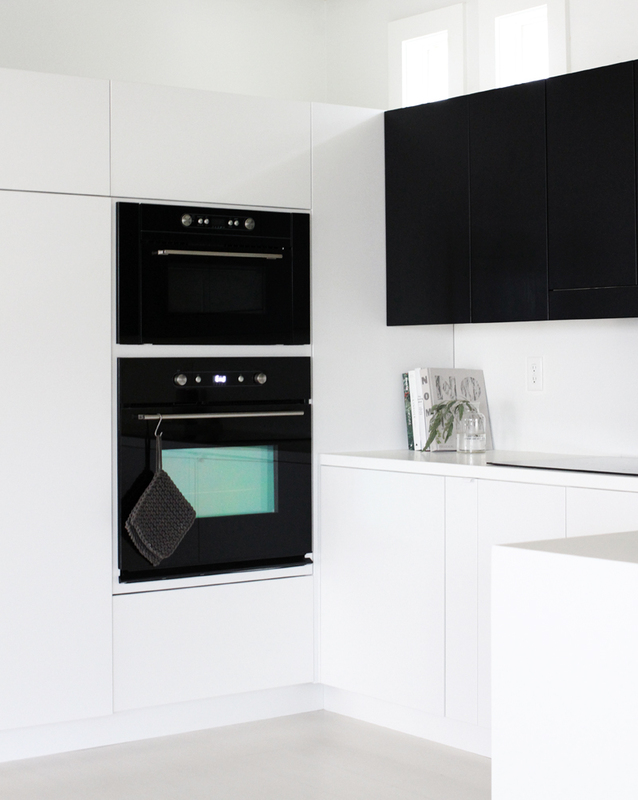 To add a little bit of masculinity we chose flat black for the upper cabinet doors which also helps balance out the black cook appliances. We decided on push buttons so that none of the doors would have handles and asked that the upper doors be made a little longer so they could pull open underneath. 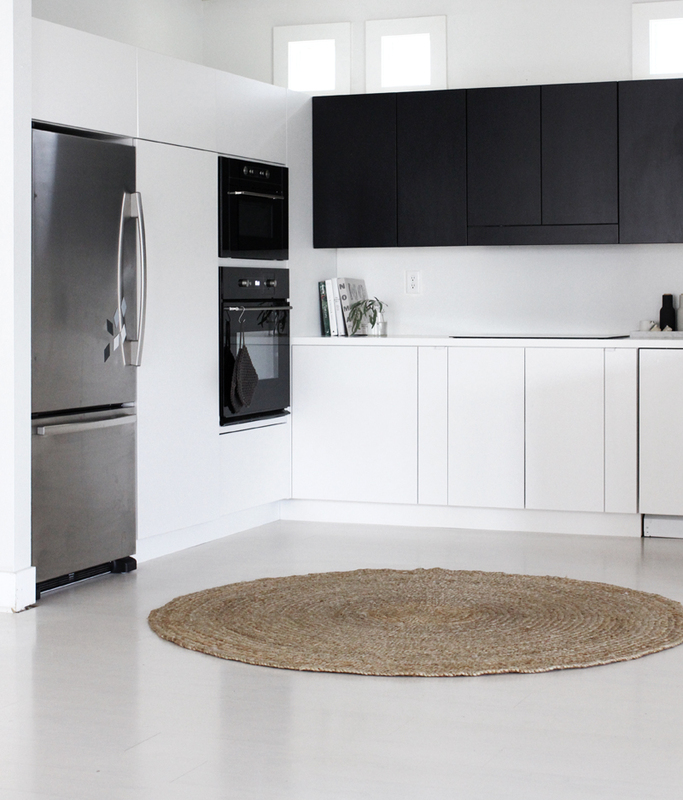 We chose some Ikea appliances because of their simple look but mostly because of their competitive warranties. 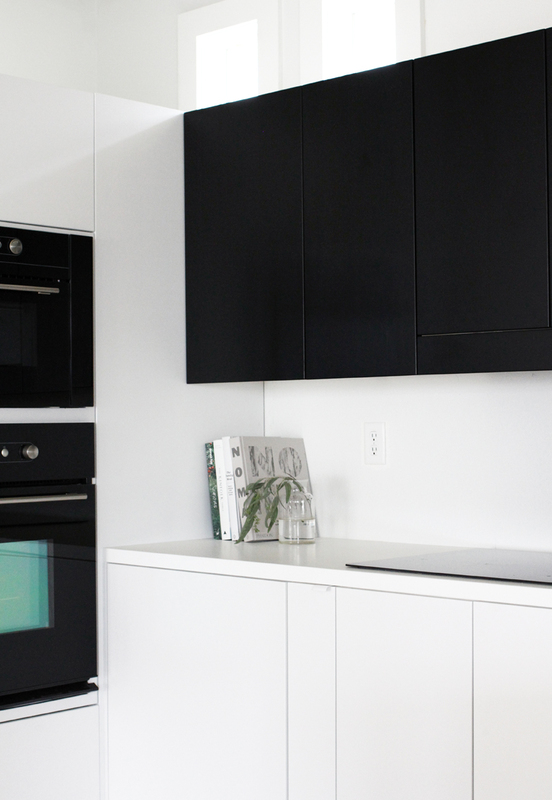 Ikea offers a 5 yr warranty on kitchen appliances, which is more than most other retailers. The cabinets were custom made by a local carpenter. My husband installed the flooring but we hired professionals for all the plumbing and electrical work. For those of you thinking of starting a similar reno. project-make sure to do some homework before you start. Compare and ask lots of questions and be incredibly thorough with those you work with. I found that many times if I did not specify the tiniest detail, people would simply default to whatever was 'standard' even if it may not be what we had wanted. I drew pictures, sent emails with photos, made phone calls and still mistakes were made. Also, if we could have moved out for a few weeks until this was done, we would have. Simply because living in a house without an oven or sink or place to prepare food is very challenging and I would not want to relive that part! love all the bright white! its beautiful!! Love the end result! Beautifully done! It was worth it. Enjoy. Tomorrow i feautured your jewelry over at the blog. Good night! It looks stunning! Really pretty! And I agree with you: doing a renovation means being able to explain what you want to the detail. But even when you do, it can go wrong. That is why we have been renovating for a few years now. We've been disappointed by people we've hired so we've decided to do almost everything ourselves.. I am glad we found some people that understand our standards in the end, but it was a struggle. It´s absolutely beautiful! Well done you two! Lookin' good! 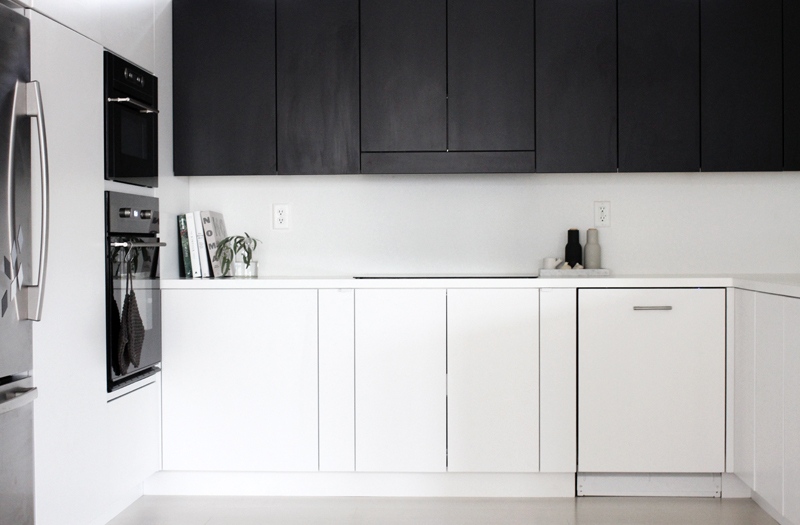 I'm just planning a kitchen renovation with my boyf and we're also getting a black and white look - only the other way around, black cabinets below the working plane (probably wood) and white upper cabinets. ;) We also have one wall painted black already. But our kitchen is a lot smaller though. Thanks for the hint about the Ikea kitchen appliances, have to go and look at them before ordering anything! Thanks for sharing- I've been patiently waiting for the photos and I'm in love! Can't wait to see the before pics. Beautiful!! where did you get that round rug? Stunning! We love the clean chic look! looking so cool I love the black cupboards! We just renovated our kitchen a year ago when we bought the house (omg, has it really been that long?!) and it's really fun to see what others are doing with theirs. 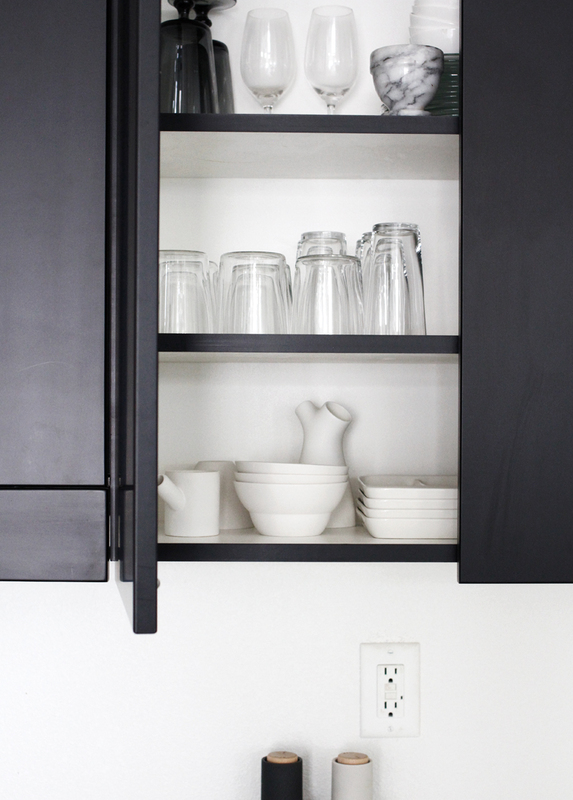 A good and functional kitchen is such an important part of home! Congrats on finishing the new kitchen. It's so modular and beautiful. Really loving how the sink blends in with the countertop. Wow, such a beautiful kitchen. Congrats!! Beautiful. Beyond my expectation. You are amazing. beautiful kitchen, very simple, wonder what type of counter top is it? Corian? Your kitchen is AMAZING! Your taste is Exquisite. Would you please share what kind of wood floors your husband installed? I would luv to tear out my tile floors and install something beautiful like yours. Wonderful kitchen! Can you please tell me where the marble try is from? I'm searching for such a tray for month!! I love the floor tiles, what color are those, where did you find them?